There's only one thing worse than a ruthless organization of psychic spies — and that's psychic spies who have been cut loose after their organization went under. We've raved about the Dark Horse Comics series Mind MGMT before, but now we're excited to bring you a glimpse of a brand new status quo for Matt Kindt's acclaimed series. 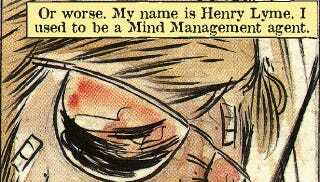 Mind MGMT #7 comes out Jan. 23, 2013.